There’s a nice little range of Boston-based or influenced bands who exploit the “fighting Irish” mentality and transform it into rough and merry punk rock, a certain wall of camaraderie among them that’s not as visible in west coast punk bands. 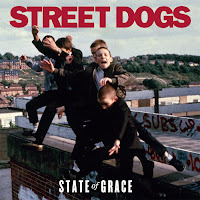 What the Street Dogs have got that the others haven’t is the biting bark of Mike McColgan, the former Dropkick Murphys frontman who’s unofficially set the style standard for his genre. Musically, there’s not much originality bursting through the Dogs’ fourth record, but their angry spirit and true lyrics compensate well. There are tributes here to several deceased – McColgan’s grandmother and firefighting uncle, as well as one of the most well-written tributes to Joe Strummer I’ve seen yet. The lead guitar on “Rebel Song” is a bit cheap and cheesy, but the band’s cover of the Skids’ “Into the Valley” is a real fighter, “ahoy” aplenty. All this plus a swipe at the NRA, a narrative on homelessness and a beautiful cover shot by '70s/'80s teen skinhead photographer Gavin Watson. Not bad. You know, Fil, I envy you just a bit for getting to witness that kind of lineup at once. What was the occasion - wasn't a festival, sounds like? I do think the Rapture seems a bit of a mismatch, though, true?